Causes of chronic sinusitis: sinus inflammation and drainage pathways Chronic sinusitis describes a persistent (twelve plus weeks) swelling of the sinus and nasal drainage pathways that prevents normal sinus drainage, leading to a build-up of mucous, infection, and the painful symptoms associated with sinusitis. In many chronic sinusitis cases, medical therapy fails to correct the underlying obstruction preventing drainage and causing infection and discomfort. 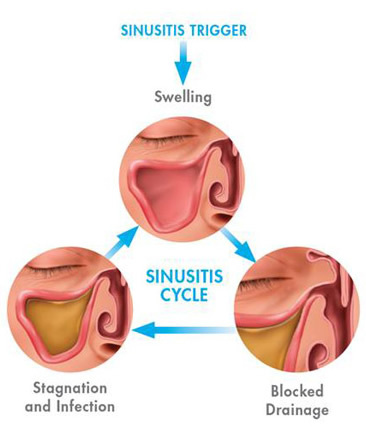 The long duration of chronic sinusitis has a serious impact on sufferers. In studies comparing individuals with chronic conditions, sinusitis patients scored worse in measures of bodily pain and social functioning (ability to engage fully in social activities with friends and family) than patients with congestive heart failure. On a personal level, chronic sinusitis might mean skipping a social engagement with friends due to fatigue. Or another difficult conversation with your supervisor about using a sick day because of a sinus headache. Or not enjoying Sunday dinner with your children and grandchildren. Balloon sinus dilation is a new, minimally invasive office procedure that reopens the sinus pathways and restores drainage to deliver immediate and long lasting relief to recurrent and chronic sinusitis sufferers. 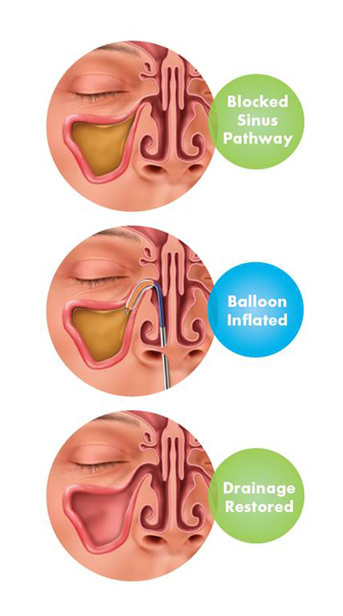 In balloon sinus dilation, our ENT specialist seeks to reshape anatomy by inflating small balloons in key places in the nose and sinus to expand sinus pathways and restore drainage. In the past, chronic sinusitis sufferers had two choices - continue with ongoing, sometimes ineffective medical therapy, or undergo functional endoscopic sinus surgery in an operating room to remove tissue and bone from sinus openings and nasal passageways. Now, balloon sinus dilation offers a new, life-altering choice for some chronic sinusitis patients - an in-office procedure under local anesthesia that opens the sinus pathways with a small balloon to restore drainage. Poor sinus drainage, which leads to infection and discomfort, is the source of persistent or recurring sinus pain. Antibiotics, decongestants, and steroids can be used to minimize the discomfort of symptoms, but they do not fix the underlying drainage problem. By restoring sinus drainage, balloon sinus dilation can provide lasting sinus relief to qualified patients, and the sinusitis cycle. Performed under local anesthesia, balloon sinus dilation offers a new, in-office choice to sinusitis patients. Patients who have received the FinESS™ balloon sinus dilation procedure have experienced significant improvement in sinusitis symptoms, and 90% return to normal activity within 48 hours. XprESS Video from Allwebcafe on Vimeo.